2016 Aprilia Dorsoduro 750 ABS. Picture credits - Aprilia. Submit more pictures. Power, lightness and agility, but also directionality, responsiveness and steering precision are its main characteristics. Aprilia Dorsoduro ABS has components, technical features and finish of the highest quality which contribute to the uniqueness of the project. Engine details: V90 longitudinal 90� V twin. Fuel system: Injection. Integrated engine management system. Electronic fuel injection with ride-by-wire electronic throttle control. Ignition: Digital electronic, integrated in the fuel injection system. Clutch: Hydraulically operated multi-plate wet clutch. Driveline: Primary drive: Spur gears. Transmission ratio 38/71 (1.87). Final drive: Chain. Transmission ratio 16/46. Exhaust system: Two in one system in 100% stainless steel with three-way catalytic converter and Lambda probe. Frame type: Modular steel trellis secured to aluminium side plates by high strength bolts. Detachable rear frame. Front suspension: Sachs upside - down. Spring preload and hydraulic rebound adjustable. Rear suspension: Aluminium alloy swingarm. Hydraulic Sachs monoshock absorber. Spring preload and hydraulic rebound adjustable. Front brakes: Double disc. ABS.Stainless steel wave floating wave disc. 4-piston. Rear brakes: Single disc. ABS. Four-piston radial calipers..
Seat height: 870 mm (34.3 inches) If adjustable, lowest setting. Factory warranty: 1-year unlimited-mileage warranty. Comments: Ride-by-Wire System. 2-channel Continental ABS system. Ask questions Join the 16 Aprilia Dorsoduro 750 ABS discussion group or the general Aprilia discussion group. Bikez has reestablished Bikez.info motorcycle web shop overview. Here we present the major online shopping possibilities for motorcycle parts, gear and accessories. This includes customizing and insurance. Search and compare products and prices. 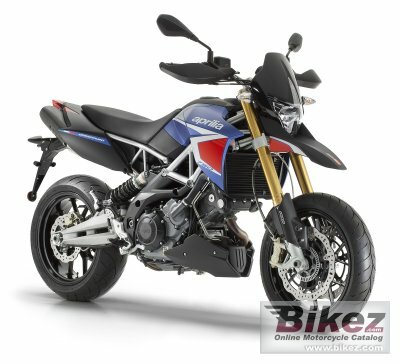 Try our 2016 Aprilia Dorsoduro 750 ABS discussion forum if you have questions or comments. Information about any technical issue is always welcome.